If you are in Utah and you are looking for things you can do, then consider undertaking these five activities this fall. This scenic park has rolling petrified dunes and stone arches that are stunning together with La Sal Mountain peaks which are often covered in snow. At least 2,000 natural stone arches are found in the park. 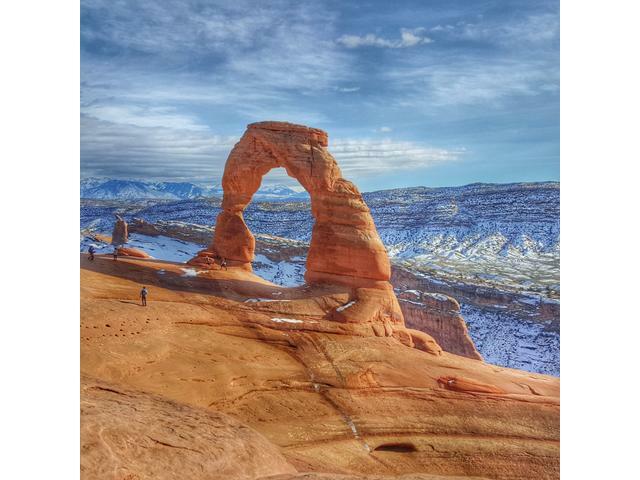 The most popular natural stone arch is the Delicate Arch, which stands like a horseshoe sprouting out of the park floor and offering a framework for the mountains at a distant. Many hikes and walking trails lead to the most famous rock formations and arches. You can see the major highlights from scenic drives via the park and access them easily from the parking areas. The central attractions in the national park are Sandstone Arch, Broken Arch, the Windows, Park Avenue, Double Arch, Delicate Arch, Devil’s Garden, Balanced Rock, and Fiery Furnace. You can find Arches National Park near Moab town where outdoor adventurers and mountain bikers get their supplies. The town is considerably lower than the park, and you can reach the park by a winding road with stunning views. Numerous other scenic parks and campgrounds are present in the area. It takes less than three hours to get to the Park from Las Vegas. The park features beautiful vistas, waterfalls, and red rock cliffs. Majority of the impressive sites in the park are present in the Zion Canyon. Zion Canyon Scenic drive will let you enjoy these sites as you drive in the floor of the valley and halt at every major site. You can also drive along the Zion-Mount Carmel Highway which runs through the park from East to West. You will be able to see incredible vistas as you drive above the valley floor. Hikers love the park due to its vertical walls, which have made people refer to it as a vertical park. The park offers simple walks on the floor of the valley and cliff-side trails such as the popular Angel’s landing trail among other activities. This park has three sections. However, the main one is Island is the Sky that attracts most of the tourists. From this spot, you can view snow-capped mountains beyond the carved canyons and vistas. The canyon is as good as the Grand Canyon, but it is less crowded. The other two sections namely The Maze and the Needles District are also stunning but offer different landscapes. They are also remote. Island in the Sky’s main attraction includes Mesa Arch. The stone arch is beautiful particularly in the late afternoon or early morning. It creates a window to the canyons, torn landscape, and buttes below. White Rim Road runs down to the valley below from the park. The road follows a dirt road comprising switchbacks along the cliff walls. The drive requires a lot of courage. You can view it from the visitor’s center of Island in the Sky. You will enjoy a fantastic scenery of red rock buttes rising from the orange floor of the desert. The location of the park is near the border of Arizona and on the Navajo Indian Reservation. This is in Southeastern Utah. Many commercials and films have been shot in this park that is popular for its stone pinnacles and red mesas. You can drive along the Valley Drive for 17 miles via a dramatic landscape and between the buttes. You can soak up the scenery and take pictures on various pull outs along the road. Sundance Resort comprises a ski report and its location is 21 km from Provo. The resort consists 5,000 acres and is based on Mount Timpanogos’ slopes. The resort is also famous for its adventurous hiking trails and biking trails. Whether you are a local or a tourist, you can undertake these top activities in Utah this fall.